The book Little Women is such a great book. The movie Little Women is one of my favorite. But some of the narrating was hard to understand. It would have been nice if there was just one narrator. 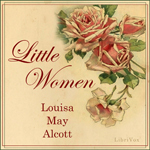 But over all I loved listing to Little Women. It's a classic. Good book. But few of the narrators are monotone and hard to follow, reading the dialogues as a very long one sentence. Have seen the movie as a child but loved the book so much more (as most books are of course better). With it being a free book some of the narrators are better than others but never the less very enjoyable. Only made it 35 minutes. Had a hard time following narrator as it sounded like ONE LONG RUN ON SENTENCE. The book is a lovely classic, beautifully written, with a timeless mastery of script and description everyone should read. The readers were not very successful in maintaining a tone or cadence fitting of the prose. Some narrators sounded as if they were reading their grocery list. Great book!Loved listening to the different narrators. Great book! No wonder it's a classic!! The various narrators were mostly great. Only a few very monotone. The narrator was the worst! I had to turn it off after ten minutes. Very disappointed. Great book for young girls. Most of the narrators are good but one of them is unbearable with plain tone and hard to understand voice. This is read by about 5 or 6 different people. it would have been better if only one voice had read it. Some readers were good. some you could hardly understand.